- On Wednesday, March 26th, my friend Whitney started a 2,180 mile journey from Springer Mountain, Georgia to Mount Katahdin, Maine. Over the past four months I have followed her and her boyfriend Kenny as they hiked through Georgia, North Carolina, Tennessee, Virginia, West Virginia, Maryland, Pennsylvania, New Jersey, New York, Connecticut, Massachusetts, Vermont and currently her home state of New Hampshire. 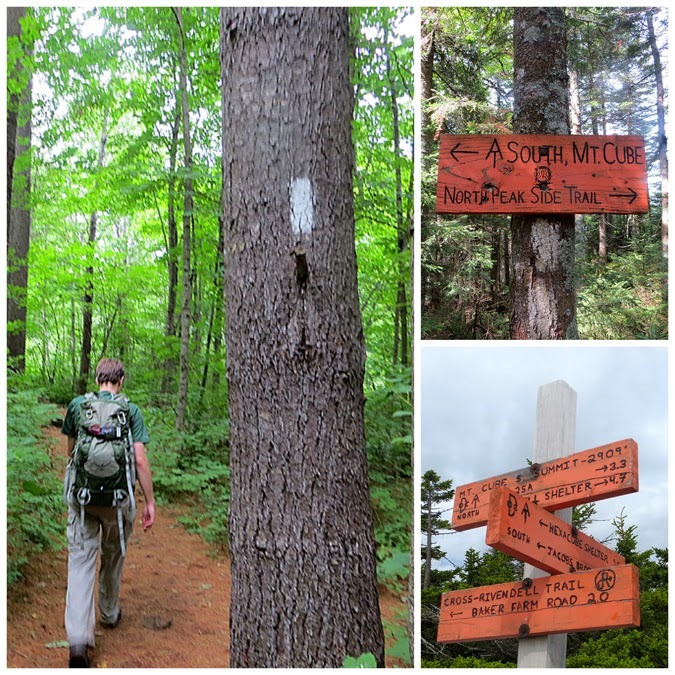 - Fortunately, on this weekend as she approached the heart of the White Mountains I was able to join along for a couple of miles with her on trail. - Friday morning my friend Matt and I met up at the Glencliff parking lot and headed to the Mount Cube Trail to hopefully run into them on our hike up to Mount Cube in the morning. Followed by trying to run into them again later in the afternoon to hike with them to the Jefferson Brook Shelter, where they would be spending the night. 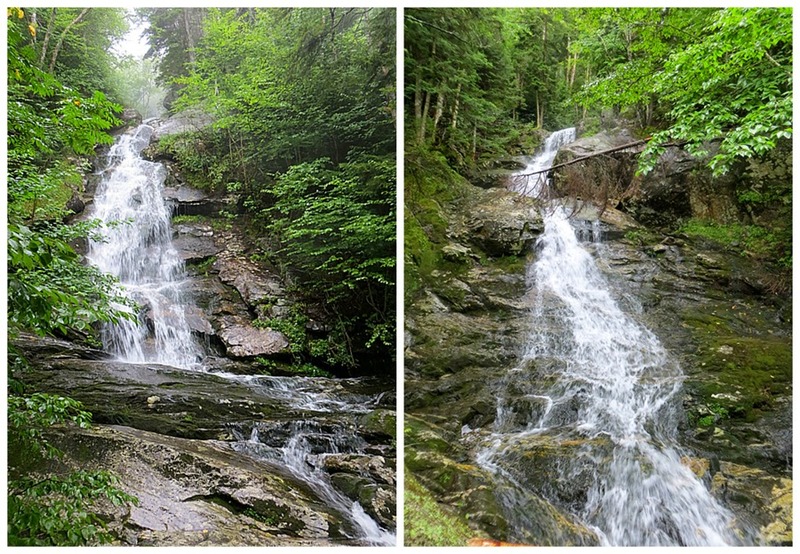 - From here we drove back to Glencliff and hiked the Town Line and Wachipauka Trail to the Webster Slide Trail junction where we surprised them again. We took a break here and ate cookies and chocolate covered pretzels. 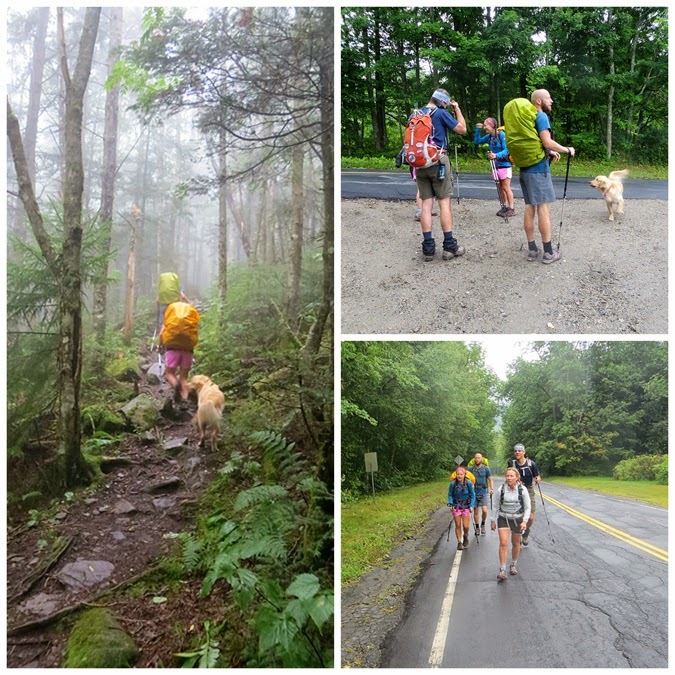 Another thru-hiker, Sprout, from Virginia, came through and stopped to enjoy some cookies and pretzels, too. 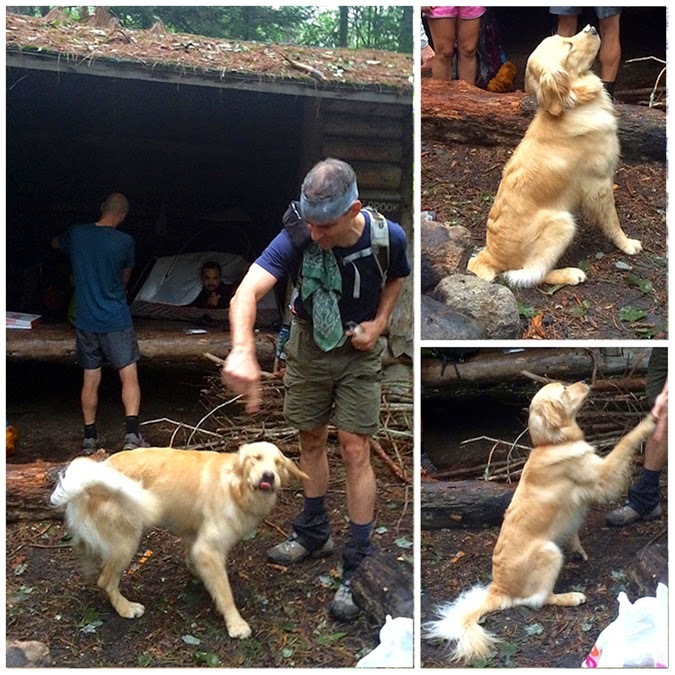 I gave Sprout a few of my granola bars before Matt, Kenny, Whintey, and myself hiked to the Jefferson Brook Shelter. - The Shelter is located off a dirt road just a few tenths of a mile from High Street in Glencliff. It's a nice area and there are plenty of spots to pitch a tent and there is a privy and a very good water source close by. Matt handed the rest of his cookies out to other thru-hikers before we took off to the Common Man for dinner and a drink. Operation 'Tip-Toe' as coined by Matt, was a success! 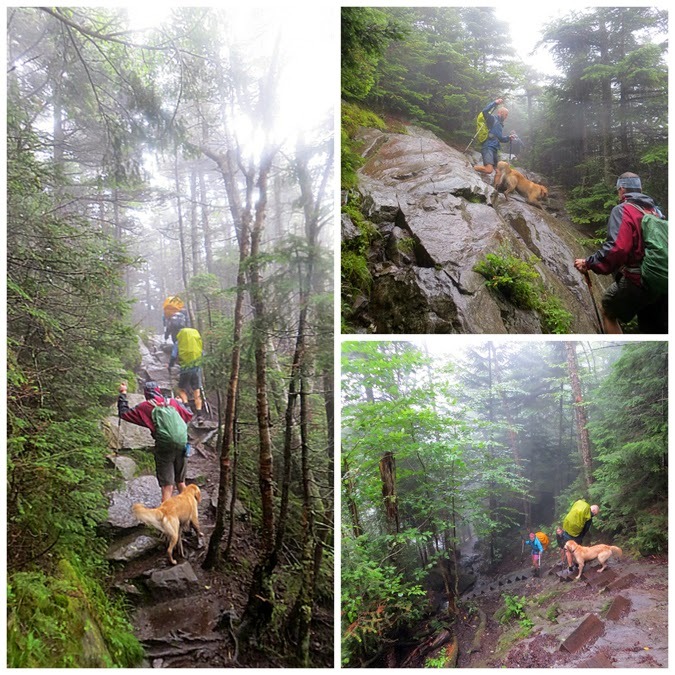 - The next morning I was meeting Denise, Tim, and his dog Gryffin at the Beaver Brook Trailhead at 7am so I drove over to Kinsman Notch and crashed in the back of the Jeep. 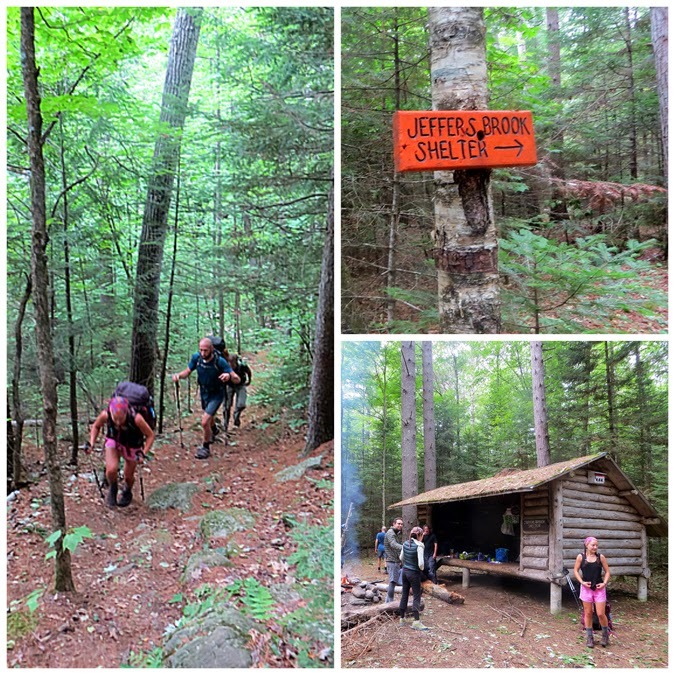 - In the morning we spotted a car at the Beaver Brook Trailhead, left some trail magic, and headed over to Glencliff to hike up and over Moosilauke with Kenny and Whitney. 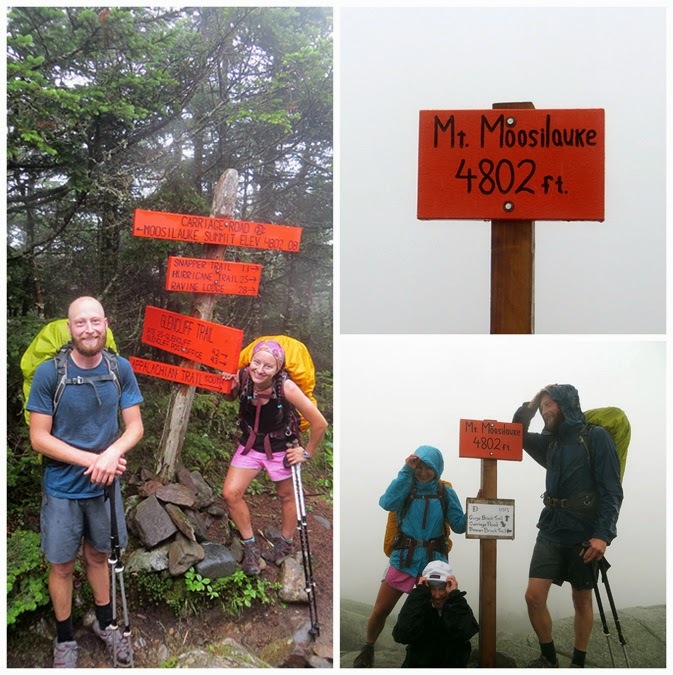 - The thru-hikers have been hiking for 1,800 miles once they start up Moosilauke, and it's their first introduction to the ruggedness and the wind of the White Mountains. The 'Moose' is one of the most popular hikes in the Whites, it's open summit provides beautiful views in all directions. Unfortunately , on this day it was in the clouds with rain showers on and off and everything was soaked and slippery. - Whitney and Kenny, both carrying 33-37 pounds on there back hammered it up the mountain, it was very impressive to watch. Whitney, has always been a strong hiker and now she's added speed to the strength, awesome stuff! 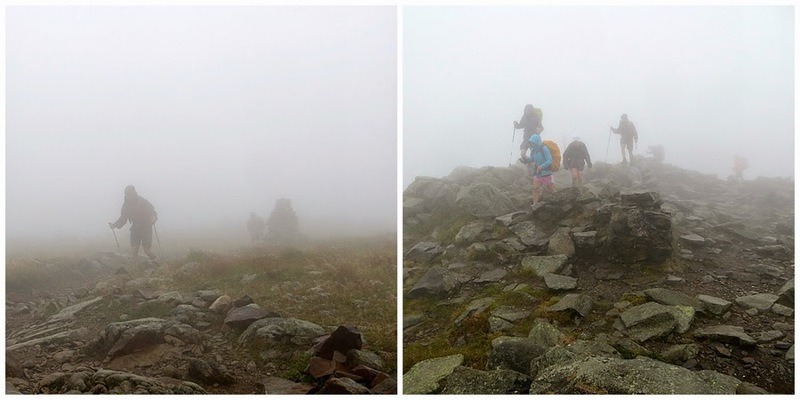 - When we gained the ridge we took a break before throwing on the rain wind-breakers for the final push to the summit. 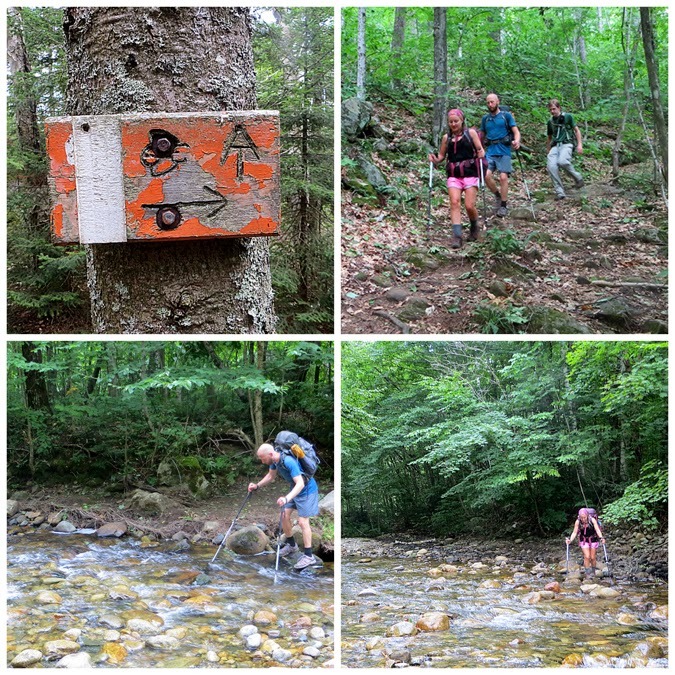 Luckily the wind wasn't too strong and the temps were in the 50's but we were a little chilled so we didn't stay long on the summit before heading down the notoriously steep and now wet Beaver Brook Trail. We took our time descending making sure not to slip, fall, and get injured as we made our way past the cascades and eventually out to the trailhead in Kinsman Notch. 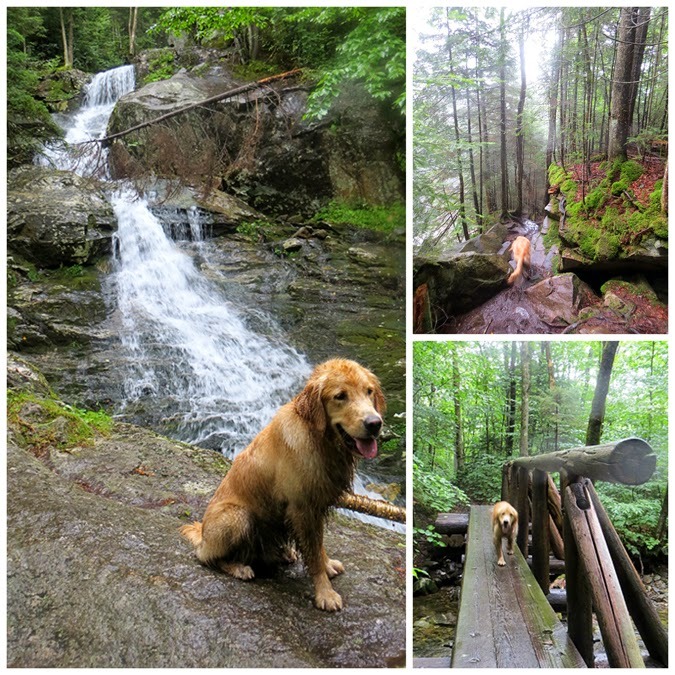 - We were all soaked from the wet conditions but it was warmer at the trailhead so it was a pleasant end to the hike. Gryffin the Golden Retriever is just like Teddy (my dad's Golden back in the day). He wants to run up ahead and run back down, and has a non-ending supply of energy. 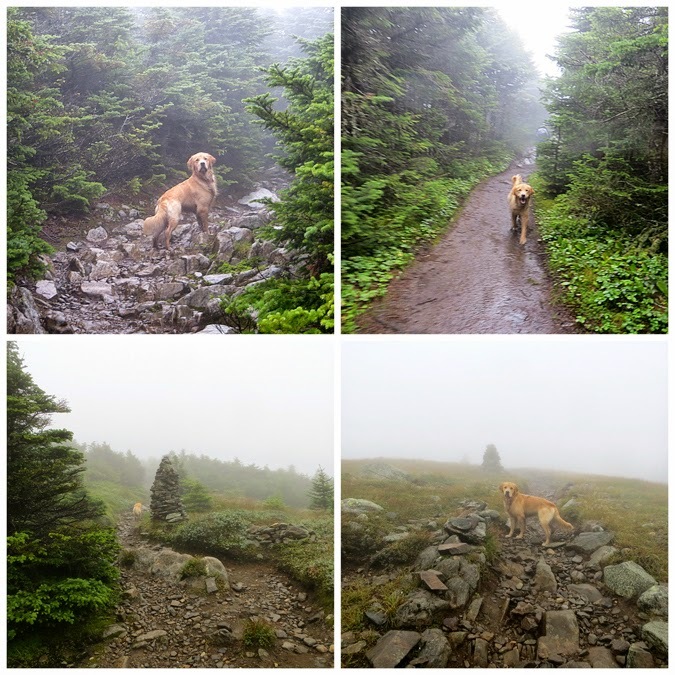 He is lean for a Golden and is already a great hiking dog having completed 17 of the 48 - 4,000 footers of New Hampshire. - After the hike we went into Lincoln to the Black Mountain Burger for a lunch. Whitney and Kenny were taking a zero day on Monday to resupply and relax with Denise before a big mile hike on Monday. - It was a great two days to spend hiking again with my trail buddy. Next weekend I will miss out on them through the Presidential Range as I'll be in the Adirondacks but I hopefully will catch them in Maine as I hike Maine's 4,000 footers and I'll definitely be there for their finish no matter if it's sunny, rainy, snowy, windy or all of the above...it's going to be Epic! Gryffin heads up the Moose! Whitney and Kenny, the summit sign, and a summit shot with Denise! Typical day on the Moose! The last re-bar section, Gryffin ran down this!